glueI brought home several ‘bits of Europe, after our hike this past summer, but there is one more that I'm incorporating into our Christmas this year. to the plaques outside of our hotel room showing our room number. Wool felt was made into curtains and bedskirts in one of our hotels as well. Its a fabric that say ‘cozy' and ‘warm' to me, which is why Christmas is the perfect time to incorporate it into our home. Not sure of the genesis of this idea, but I had been looking for ways to use felt and somehow this felt holly leaf garland popped into my mind. 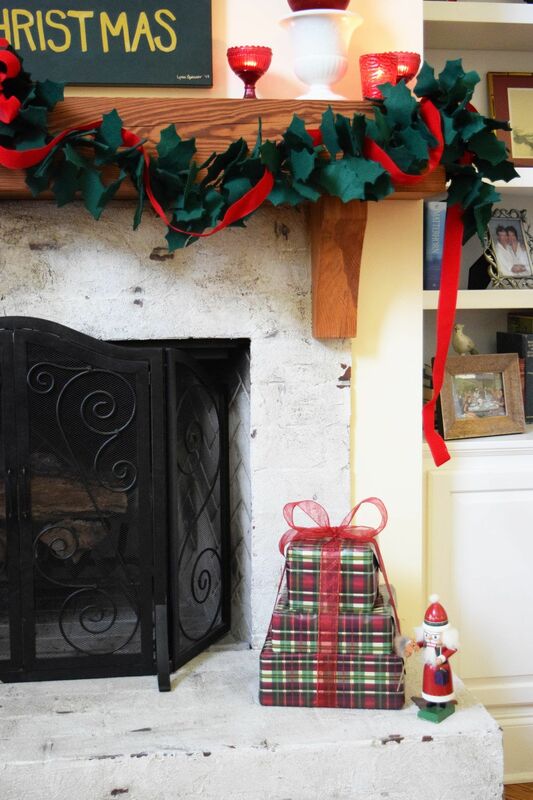 It worked well with the re-vamp of my Christmas mantle and it was an easy, relatively inexpensive craft to whip up. 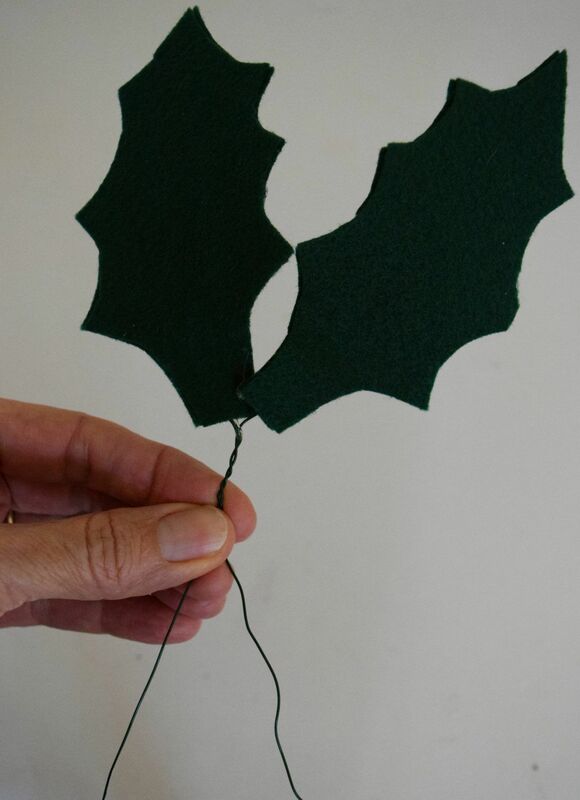 Pin the pattern to your felt and start cutting MANY leaves out. 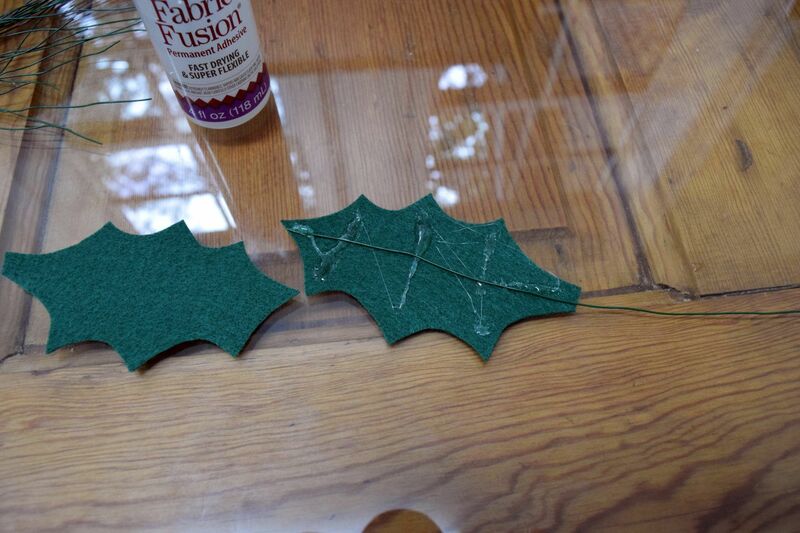 I used 2 layers of felt each time I cut so that those 2 pieces would align when I glued them together. For my 9 foot garland, I cut 200 pairs of leaves out. Cut your wire so that it will be as long as your leaf, with 4 inches extra. For my garland, I cut my wire pieces 8″ long. Glue your leaves together, with a piece of wire running the length of your leaf. And because nothing says “Christmas” like an episode of The Walking Dead, I was able to catch up on the goings on while I glued many leaves together…Two birds with one stone. Once you have your leaves made and they've dried, it's time to make your garland. This is the very quick part of the craft. Grab 2 wired leaves and twist them together. Then go down a bit and add a third. I varied how close I would add the leaves and if I would add a pair of leaves together or not. I made my garland in 2 segments, so that the finished ends would be at either end of the garland and the ‘unfinished' twisted wire pieces would be wired together in the middle. The middle is where I added my red ribbon. 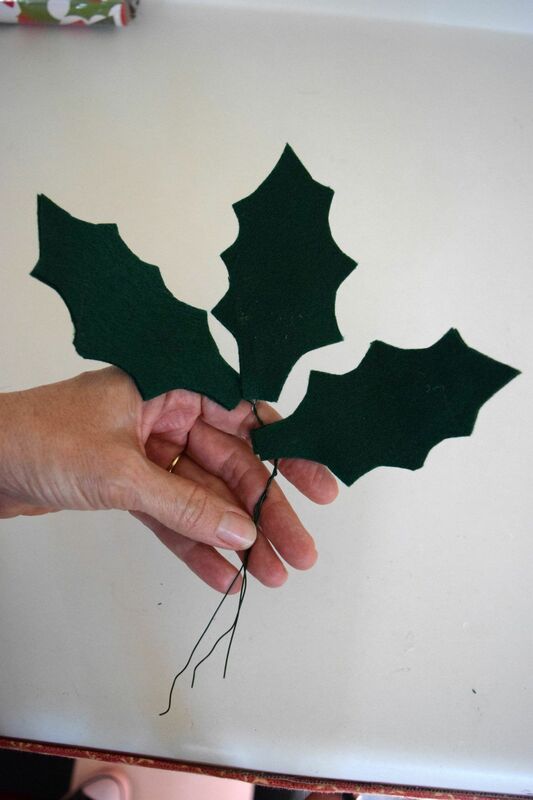 This felt holly leaf garland was easy to make and definitely is different from the fresh greens I've used in the past. I'm pretty pleased with how it works with Santa's portrait and with the ornament topiaries, a little bit of an ‘old world' look that works with my mantle. And it's a seasonal reminder of all the wool felt that we saw throughout our trip this past summer. And speaking of Santa's portrait…Don't you absolutely love him? I've got to tell you that he may be one of my favorite paintings. I received several questions about where you could get a Santa for yourself and so I recently added him to my Society 6 store. You can find him here. Have you started prepping for Christmas? If so, what have you done? Hi your holly garland looks great and the tutorial really clear. You have given me an idea about making my own felt leaf garland, thanks for the inspiration. Good Morning Claire..Thanks for stopping by…my fellow felt friend! I’d love to see what you do with your felt garland! I love the Santa Picture! Did you paint this yourself? Hi Mona, yes I did paint him…rather on a whim! Got to say I’m pretty tickled with how he turned out as I was working with a black and white photo. Thanks for visiting and for your kind comment. Thanks Coco…truthfully, it was a pretty easy, fairly mindless endeavor. Sat down in front of few football games and movies and knocked them out. They don’t have to be exact, so while I used a pattern, I wasn’t concerned about cutting right up against pattern. It was there more as a ‘guideline’. But I am pleased with it so thanks for your compliment! Going to check out your sugar scrub! Sounds delightful! Lynn it’s beautiful! 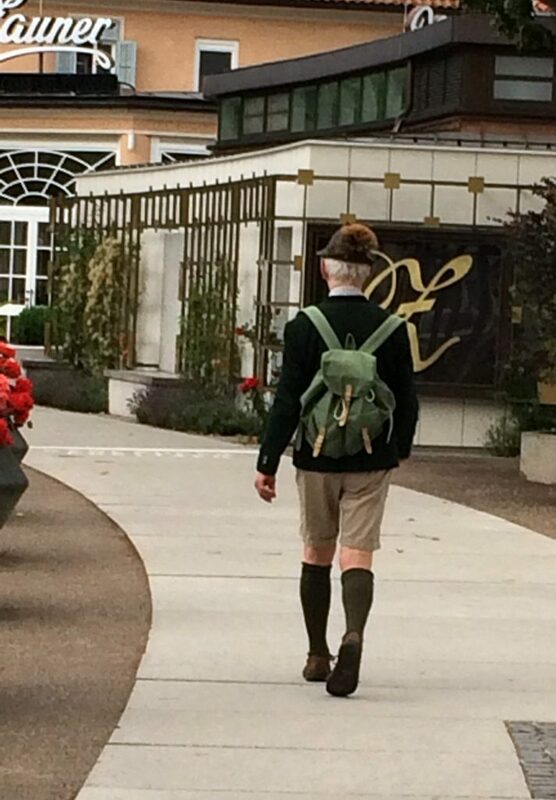 Wunderschoen!!! I had no idea you made it with felt when I looked at your beautiful Santa Picture the other day! 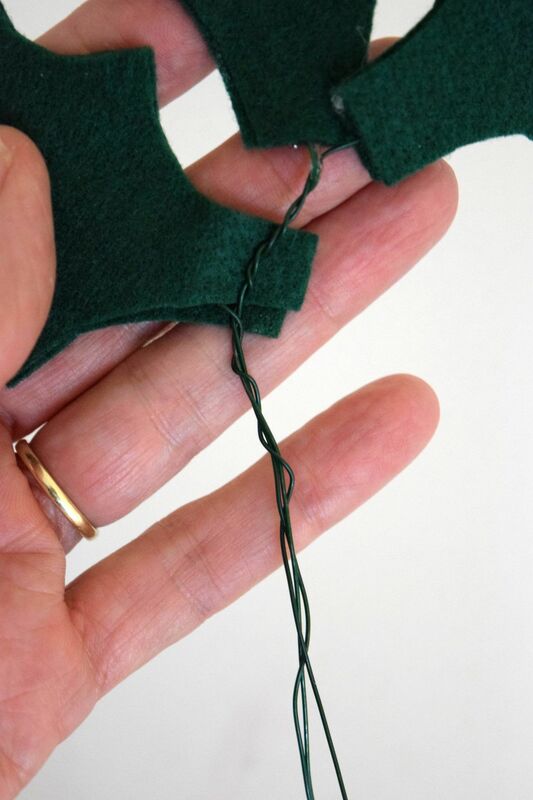 I love using felt, it’s so easy, and like you said, it is cozy and just perfect for this time of year! And yes, of course, what better to go with a craft like this than the WD! It’s nerve racking isn’t it, when will they let us know what’s going on with Glenn????? Ok back to the garland! I also love the shape of holly leaves! Just right! my whole house is ready for Christmas, I got in a mood the other day and couldn’t stop! Have a great weekend Lynn!!! Hello Katrin, thanks for your kind words! The felt does remind me of our time in your home country! Just another piece of Germany and Austria that we brought home! So…I’m up to date on WD and still really believe Glenn is alive…like 95% certain. And glad my buddy Daryl made it out of his recent predicaments as well! Looking forward to Sunday…or Monday as it always seems to be for me! So you’re all decorated? Wow! We will be doing that this time next week when our daughter is home from school. Looking forward to it! 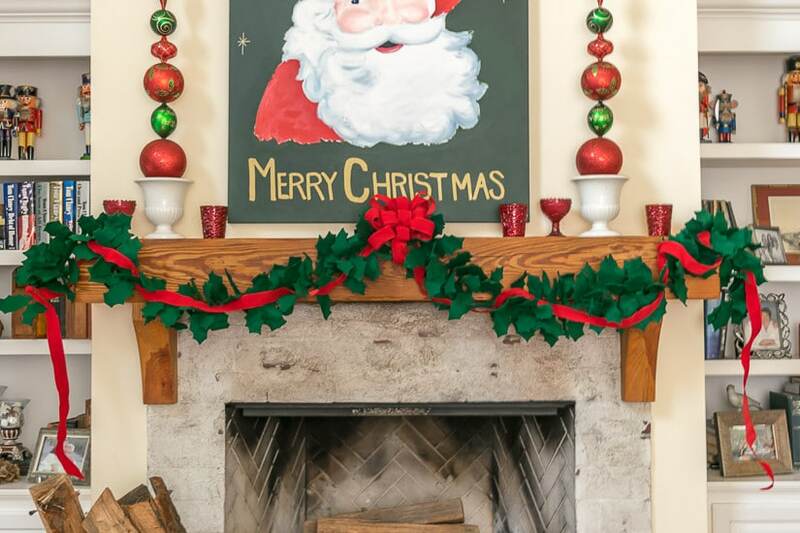 Lynn, what a pretty garland and a great tutorial as well.It works perfectly with your commanding fireplace. I really like your Santa painting as well. Did you make that yourself? As for decorating, I;m supposed to be starting this weekend, let’s see how far I get. Hi Mary, thanks for visiting today and Congratulations again on your Respect Award! I did paint my Jolly Old Elf…rather on a whim. But I’m pretty tickled with him and my felt garland. We will really do our decorating this upcoming weekend, it’ll take the better part of 2 days. But…I really need to start weeding through my ornament and decorations boxes and be a bit more selective as to what I’ll keep. Thanks again for visiting and have a great day!? Lynn, this is beautiful! I love the cozy look of wool felt too, and now I’m trying to figure out if I can work one in to our decor too! Thanks for the inspiration! Hi Kimm, hope you can find a place for the felt! I don’t think I’ve fully exhausted the ‘felt experience’ and feel another project coming on! This is so pretty Lynn! And what a great tutorial! Thanks for sharing at Something yo Talk About! Thanks Karen. Have a wonderful Thanksgiving. Hi Margaret, thanks for stopping by this morning. I am equally anxious to try my hand at Portuguese food. I really do enjoy making foods from different cuisines and Portuguese is one I haven’t tried yet. Thanks for all the recipes. It’s so pretty! Thanks for posting. Hello from Best of the Weekend. Thanks for visiting today Melissa. Once again, I must say that I am so happy to have found your site. Your ideas are wonderful and your talent is amazing. We always managed to exchange ornaments in our family, too. As a crafter, I made many of the ones I gave – in tough years, they were my only gift, in other years they were attached to the bows of the packages. The most beloved tradition among the women in our family was started by my mother. We each received a calendar towel matching either our kitchens or our interests. Of course, the packages, marked from “Santa” were all the same and every year we all said “Oh, I wonder what this could be.” Then we all had to open them at the same time. My mother is gone, but my sister carries on the tradition, and though we may not all be together, those of us who are, still go through the ritual. 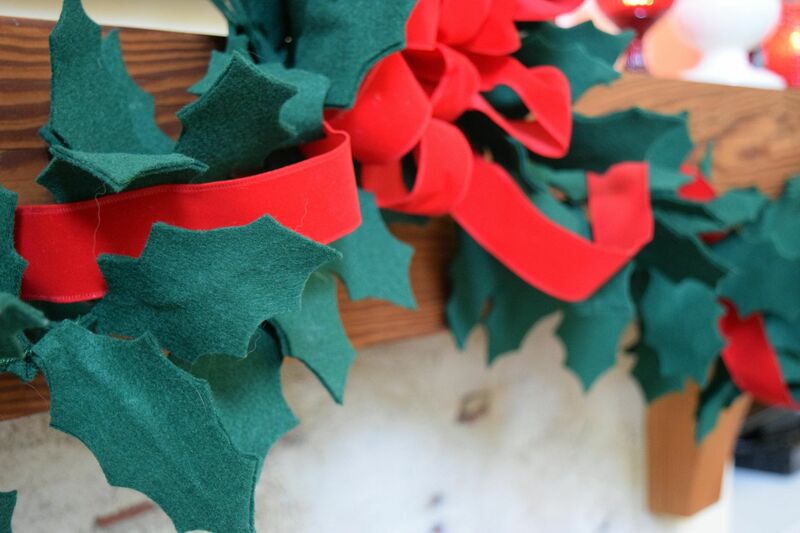 But my favorite of this particular edition of Nourish and Nestle is the felt garland. I studied for a summer in Salzburg, Austria and managed to visit the family Ihad lived with for Christmas a few years later. Too many projects going already this year, but that garland will be on next year’s list. Have a blessed Christmas season! You make me feel so good!I love that idea of the Calendar towel, I am sure you have quite a lovely collection. And I do enjoy the gifting of ornaments..it is so lovely to decorate our tree year after year with all those memories. How wonderful that your sister carries on your mother’s tradition…how blessed you all are. And I can only imagine your mother smiling down that her traditions are being carried on. Do you associate Austria with wool felt like I do? 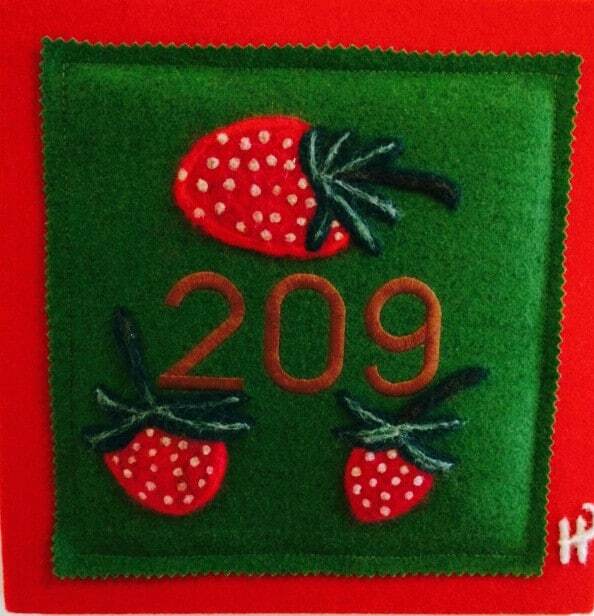 It was ubiquitous…one hotel even had there room numbers in wool felt. I do hope you have a wonderful Christmas my friend.